Planting hedging is a very easy, job which you can do yourself. Whether it's pot grown, bare root, cell grown or root balled, it's the same principles; good ground preparation, plenty of space for each root, elimination of air pockets and plenty of water not just when the plants are going into the ground, but in the weeks following planting until the plants are fully established and able to fend for themselves. We provide our planting instructions as pdf files so that you can print them off from our website to get ahead with the preparation. Please print off the relevant planting instructions below, as whilst there is a great deal of similarity, there are some important differences in the planting methods for pots (including topiary)/cell grown, bare roots and root balls. 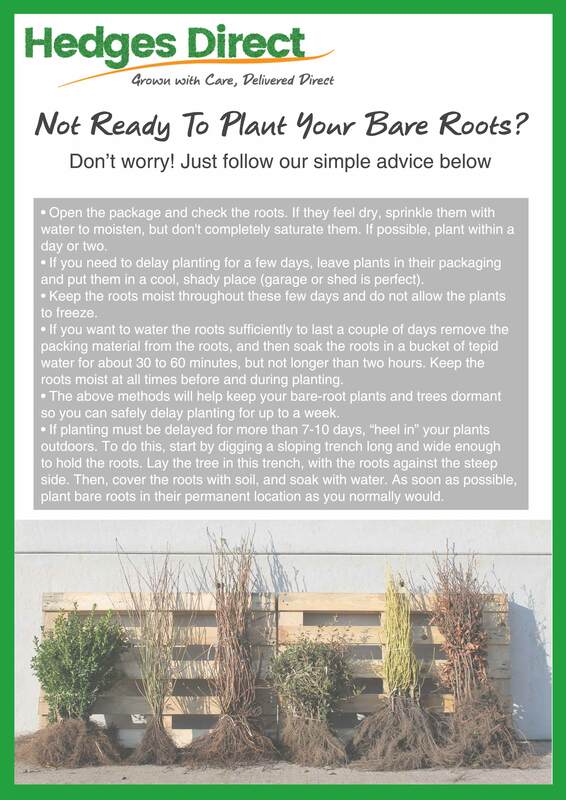 See our 'How to Plant a Bare Root Hedge' video below. (More videos to follow soon). Prepare the ground in advance - clear all weeds at least 30cms on both sides of the proposed hedgeline. Dig a trench, then prick the sides and bottom of the trench with a garden fork so that the roots can establish. For pot grown and cell grown plants, the trench needs to be about twice as wide as the pots/root structures. Rootballed and bare root plants will need a trench twice as wide as the root structure. Gently tease the roots of pot grown plants and plant them (at the same depth as they were in the pot) into the trench, or in the case of bare root and rootballed plants, plant to the damp line on the main stem where you can see they were previously planted in the fields. Leave the rootballed plants in the netting - its biodegradable. Cell grown need an inch of soil over the top of the roots. Cover with mulch to stop weeds establishing and reduce water loss from the soil and keep your new hedge well watered until its root system is fully established. Keep the whole area clear of weeds and grass for at least 2 years. The quick method for bare roots is to just dig a large spade into the soil (go as deep as possible), push the spade and soil away from you to expose a hole in the ground, pop the bare root into the hole, release the spade and firm in. This method is suitable for fertile, moist soil which has already been weed-treated. Our own landscaping team can do up to 500 small bare root plants per day with this method but they're used to it! Amateur gardeners would do well to manage 200 per day allowing for tea breaks! It's a nice job on a dry winter day.